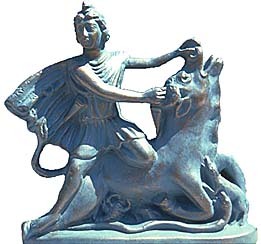 Of what significance could the image of Mithras slaying the bull have to Jung and his secret Mithraic identity? Let us first imagine the classical tauroctony, the only image found universally in Mithraic cult sites and the central icon of Mithraism: Mithras is typically depicted as wearing a Phyrigian cap (a felt cap that would have represented someone from the eastern reaches of the Roman empire). His left knee is on the back of the bull, pinning it down. With his left hand, he is pulling the head of the bull back by its nostrils, and with his right hand he is slaying the bull by plunging a dagger or sword into its neck. Mithras's cape is usually billowing out in a curved shape behind him, and on its interior are sometimes depicted seven stars -- the seven planets known to the ancient world. A scorpion is generally depicted attacking the bull's testicles, but other figures are also shown -- namely, a snake, a dog, a raven, and sometimes a lion and a cup. The tip of the bull's tail takes on the form of an ear of grain. Two torchbearers, Cautes and Cautopates, are dressed like Mithras and hold torches pointed up and down, respectively. One intriguing theory of the meaning of the tauroctony is Ulansey's astronomical interpretation. The key component is the fact that the spring and autumn equinoxes occur within the period of one of the twelve zodiacal constellations and that they proceed backward through the zodiac every 2,500 years or so. Since about 4000 B.C.E. the precession of the spring equinoxes has moved from Taurus to Aries to Pisces and, soon, will move to Aquarius. In brief, the discovery of the precession of the equinoxes led Stoics in Tarsus to "hypothesize the existence of a new divinity responsible for this new cosmic phenomenon, a divinity capable of moving the structure of the entire cosmos and thus a divinity of great power." Mithras was this deity, and he is seen killing the bull because the act symbolizes the ending of the cosmic age in which Mithraism was born. The Mithraic tauroctony is explored repeatedly in Jung's fateful chapter in Wandlungen [und Symbole der Libido ], "The Sacrifice." This image obviously held deep significance for him. His interpretation was that Mithras was the "sacrificer and the sacrificed," but "it is only his animal nature that Mithras sacrifices, his instinctuality." Yet the text holds another layer of meaning. In MDR, Jung reports that he waited two months before writing this chapter because he knew that his new ideas on the nature of the libido would cost him his relationship with Sigmund Freud. By 1912, Jung had been deeply immersed in attempts to try to make sense of the tauroctony for at least two full years, and the problem had fascinated Freud for the same amount of time. The image was consistent from Scotland to Italy to Anatolia; it clearly meant something. The killing of the bull, the scorpion biting the bull's testicles, and so on were symbols that were begging for psychoanalytic interpretation. As their correspondence shows, Freud and Jung did not see eye to eye on the meaning of the Mithraic mysteries. And their disagreement over the tauroctony is a telling sign of dominance of Mithraism over psychoanalysis in Jung's own personal symbolic system. In a letter sent in June 1910, a month after Jung's first public lecture on the psychological interpretation of mythological and Mithraic material, Freud offered Jung his interpretation of the bull slaying: It was "the killing of the animal ego by the human ego, as the mythological projection of repression, in which the sublimated part of the human being (the conscious ego) sacrifices (regretfully) its vigorous drives." Jung disagreed. Instead, he told Freud, "there must be something very typical in the fact that the central symbol of fecundity, the useful and generally accepted (not censored) alter ego of Mithras (the bull) is slain by another sexual symbol. The self-sacrifice is voluntary and involuntary at once (the same conflict as in the death of Christ)." Here we see the beginnings of Jung's firm but polite rejection of Freud, dismissing the psychoanalytic role of an unconscious censor that keeps the instincts out of awareness and putting forth instead a more pagan interpretation that views the Mithraic bull as an accepted alter ego of Mithras. There is yet another, more poignant meaning of the tauroctony for Jung, and, indeed, it forms part of a secret encased in the cista mystica of Jung's life and work. Jung notes in this same letter of June 26 that, "the Mithras myth has undergone an adaptation to the calendar." This reveals that Jung has read Cumont and has likewise noted the astronomical and astrological basis of Mithraic symbolism. Jung may have initially taken up the study of astrology to decipher Mithraic symbolism. "My evenings are taken up largely with astrology," he wrote to Freud on June 12, 1911, further reporting that, "I make horoscopic calculations in order to find a clue to the core of psychological truth." In 1911, Antonia Wolff had entered Jung's life as his assistant, and she is believed to be the one who taught him astrology. He knew that the astrological sun sign of Sigmund Freud, born on May 6, 1857, was Taurus, the bull. The centrality of Mithraic tauroctony in "The Sacrifice" now taken on new meaning: it symbolizes the triumph of Jung's broader concept of libido over the strictly instinctual (sexual or venereal) libido theory of Freud. More important, it symbolized Jung's sacrifice of Freud. His final break with Freud is therefore heralded with every reference to the "killing of the bull." In early 1912, Jung connected the Mithraic tauroctony with the astrological sign Taurus and with sexuality in a very suggestive footnote to the section on which the tauroctony is discussed in detail: "Taurus is astrologically the Domicilium Veneris." This was no doubt another hint to Jung's readers that this chapter contained veiled references to his knowing sacrifice of his relationship with Freud and Freud's sexual theory of libido. Did Jung's fascination with the Mithraic image of the slaying of the bull feed into Freud's fears that Jung had a death wish against him? Freud was a master of the language of symbolism and would cast an analytic glance on any obsessions, especially those of a trusted disciple who may have harbored secret desires to slay the father. * Mithras - This page by Payam Nabarz is dedicated to the Sun God Mithras.